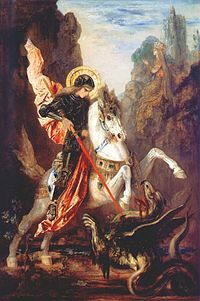 It is likely that Saint George was born to a Christian noble family in Lod, Syria Palaestina during the late third century between about 275 AD and 285 AD, and he died in Nicomedia. His father, Gerontius, was a Roman army official from Cappadocia and his mother, Polychronia, was from Palestine. They were both Christians and from noble families of Anici, so by this the child was raised with Christian beliefs. They decided to call him Georgius (Latin) or GeÅrgios (Greek), meaning “worker of the land”. At the age of 14, George lost his father; a few years later, George’s mother, Polychronia, died.Eastern accounts give the names of his parents as Anastasius and Theobaste. Then George decided to go to Nicomedia, the imperial city of that time, and present himself to Emperor Diocletian to apply for a career as a soldier. Diocletian welcomed him with open arms, as he had known his father, Gerontius “” one of his finest soldiers. By his late 20s, George was promoted to the rank of Tribunus and stationed as an imperial guard of the Emperor at Nicomedia. Recognizing the futility of his efforts, Diocletian was left with no choice but to have him executed for his refusal. Before the execution George gave his wealth to the poor and prepared himself. After various torture sessions, including laceration on a wheel of swords in which he was resuscitated three times, George was executed by decapitation before Nicomedia’s city wall, on April 23, 303.